Pittsburgh Happy Hour: STANDARD - Washington D.C. So occasionally I am so amazed by a menu offering that I simply cannot say no. Standard in Washington D.C. is this wonderful outdoor bar with a pleasant selection of German beers. While looking over the beer menu I noticed something amazing. An entire pig's head for only 18 dollars!! Although I had just eaten a large breakfast pizza, I simply couldn't resist. 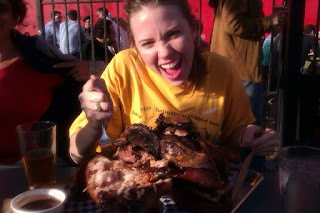 The most difficult part of dealing with this pig's head was determining how to eat the thing. The staff at Standard gave us very little instruction. The waiter simply said, "just flip it over and starting spooning it out." We ate most of the cheek meat which was succulent and wonderful, very fatty and similar to pork shoulder. Next I believe we ate part of the brain and some of the throat glands, I'm not really sure. I would describe that meat as a little more coarse in texture with a much richer flavor. We managed to garner the attention of the entire restaurant while trying to eat the thing, we even convinced some other patrons to order their own pig's head.